Visiting a foreign country is always special when tourists get to know the locals more. In Malaysia, the best way to experience the country is through interacting with the Malaysians, understanding their culture and heritage from their point of view. One of the universal languages that many people from all over the world speak is through gambling. Oftentimes, gamblers never have to say a word when they interact with their opponents. It is like they let their cards do the talking. If you want to visit Malaysia and experience it as a local would do, it is highly recommended to learn how to play Penang rummy so you can be ready in case someone battles you into a game or two. Also known as Si Rummy, Penang Rummy is one of the many variations of the Rummy or Gin Rummy card game, believed to originate from Penang in the latter part of the 1980s and eventually became a widely played card game all throughout Malaysia. The word “Si” means “dead” in Penang Hokkien language and signifies the card game’s nature wherein a hand can be dead – no player can draw or exchange new cards during the game. This is also the distinguishing feature of Penang Rummy from other Rummy variants. Penang Rummy’s main goal is almost similar to other Rummy card games – players have to set up melds and remove deadwood cards or cards that do not create a meld. Players need to discard these deadwood cards as they add to the total points at the end of each hand and the goal is to be the player with the least points of all. The game uses a regular 52-card deck with 6 or 8 jokers that act as wildcards. In total, a game uses about 110 cards and can have a maximum of four players. It is also possible to play the game with only three players, allowing each player to have more cards to start with. The game starts by choosing the first dealer. This can be random but the succeeding hands will change depending on who is the player with the most points. Ideally, there are two ways to determine the first dealer. In card games where players do not record their points, the player deemed as the worst loser will automatically deal the cards as it is like they are paying a service. 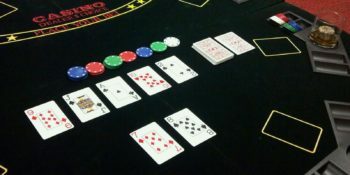 However, for games with recorded points or money games, the winning player will automatically become the dealer as a gesture of appreciation. The dealer will start giving out the cards from his left and proceed on a clockwise direction until each player gets 20 cards each. For games with only three players, each player will have 25 cards and the remaining undealt cards will no longer be part of the play. Like dealing, the play will follow a clockwise direction. On their turn, each player can either meld, lay off, or both. They are not allowed to skip a turn. Players can do as much action during their turn but they can only do lay off when they already have made their first meld or “passport.” Do note that Penang Rummy does not require its players to draw or discard cards. Runs – a group of three or more cards of the same suit arranged in a sequence. Players can play a low (A-2-3-4) or high (J-Q-K-A) Ace but it cannot continue after high Ace (Q-K-A-2). Sets – a group of three or more cards having the same ranking. For example, Q♥-Q♦-Q♣-Q♠. Unlike other Rummy card games, Penang Rummy allows suits to duplicate, especially in games where two decks are used. A player can lay off some of their cards on their hand on an already existing meld. This allows the player to add to a run or a set in an existing meld of their own or their opponent. For example, a meld with a 5♥-5♦-5♣-5♠, they can add another 5♥-5♦. A meld of 4♦-5♦-6♦7♦, can have a lay off of 3♦ or 8♦. Take note that in Penang Rummy, the better it is for the player to get the least points as they are the ones declared the winner whilst the one with the highest point will be the biggest loser. Some choose to keep points in each game to determine the overall winner. Penang Rummy allows the players to exchange a wildcard on the table (in a set or run) with a card in his hand, as long as the card fits the arrangement. This move is not counted as a valid action so the player must still make a meld or a lay off. At the start of the game, players must make a meld before they can do any other action. This first meld is the passport. If they do not make one, this results in an instant “Dead,” or sitting out on that particular round. It is actually impossible not to make a meld due to the great number of cards each player holds that is why ending up “Dead” is often an unlucky turn for a player. When the player cannot make a valid move during his turn, he has to announce “Dead.” This will allow the other players to proceed except for the player who announces his dead card. In effect, that player will have cards including its points towards him. So it is always best to delay the declaration a bit further into the game when they still can dispose of their deadwood cards. You may find it unusual for a player to lay off their cards one by one since it will keep them alive for several turns. Whilst the game is typically played by locals in the comforts of their basements, kitchens, and even airplanes, many are finding ways on how they can play with more people. In recent years, rummy has grown its reach thanks to the power of the internet. Many websites now offer players an avenue where they can play rummy against anyone anywhere in the world. Some available websites offer easy free games whilst others offer online casino-style rummy sites allowing players to play competitively against other players. These casino styles games offer avid Penang Rummy players the option of playing for real money so they can expect a more serious and challenging game of rummy. Players who want to experience rummy can choose to play in real money games, with stakes ranging from 10 coins and up. Start at a level that they are most comfortable at before they rise to the ranks of the high rollers. It is also a good practice before heading to Malaysia and challenging a local in a game or two.